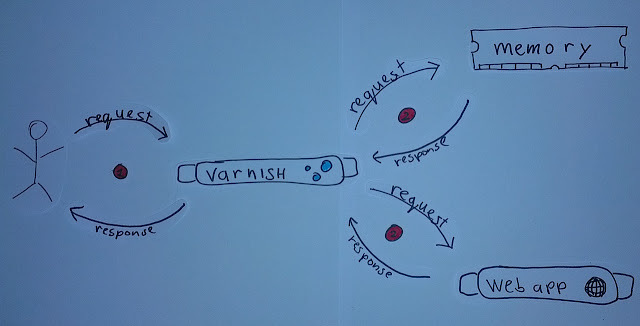 Varnish is an open source reverse HTTP proxy, an HTTP accelerator, and a useful tool for speeding up an Apache server. It can listen as your primary end-point and then serve the content of your back-end to the client and cache the content during response. Varnish can improve your normal website loading speed by tremendous amounts if you serve high traffic. Replace IP_ADDRESS with IP of Apache instance ( localhost if it's on the same machine ). We shall make Apache to serve on 8080 Port. Now we have to make sure apache serves on 8080 port, by default it is set to serve at port 80. For this we will edit /etc/httpd/conf/httpd.conf file. Find and replace Listen 80 with Listen 8080.